This weekend saw the quarter finals of the FAWPL Cup and Plate competitions being played. 4 sides from the FAWPL Southern Division had reached the quarter finals of the FAWPL Cup with 3 of those making it through to the semi-finals of the competition on Sunday. Cup Holders Tottenham Hotspur Ladies were at home playing fellow Southern Division side Crystal Palace Ladies who had a few players out through injury and illness. Tottenham got off to a brilliant start Nikita Whinnett putting them into the lead after just 14 seconds. Whinnett went on to score again in the 7th minute to make it 2-0. Wendy Martin heading the ball into the back of the net with 4 minutes left in the 1st half to see Tottenham lead 3-0 at the break. 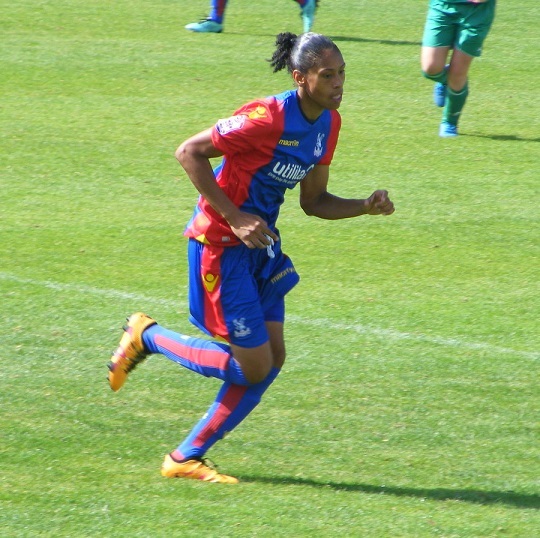 Rochelle Shakes pulled a goal back for Crystal Palace Ladies 8 minutes into the 2nd half however Tottenham restored their 3 goal cushion on 68 minutes Bianca Baptiste on target with the goal the final score 4-1. Cardiff City Ladies are also through to the FAWPL Cup semi-finals winning away from home on Sunday against FAWPL Northern Division One side Liverpool Marshalls Feds Ladies. Their lower league opponents holding them to a goalless draw at half-time before goals in the 2nd half from Michelle Green and Cori Williams saw the welsh side advance into the last 4 of the competition. Charlton Athletic Women are also through to the semi-finals after being taken all the way to penalties at home by FAWPL Northern Division side, West Bromich Albion Ladies. Kit Graham gave Charlton the lead in the 19th minute at Sporting Club Thamesmead. Amy Dickens pulled the score back level at 1-1 for West Brom just after the half-hour the scores remaining that way for the rest of the game, extra-time didn’t see anyone break the deadlock the tie heading to penalties, Charlton winning the shootout 4-2 to win a place in the last 4 of the FAWPL Cup. Making up the last 4 in the FAWPL Cup are FAWPL Northern Division side, Blackburn Rovers Ladies after a 3-1 win away to Northern Division One side, Chester Le Street Ladies. 3 sides from the FAWPL Southern Division and South East Division One had made it through to the quarter finals of the FAWPL Plate. Two of those set to face each other, Luton Town Ladies from South East Division One at home to Lewes Ladies from the Southern Division both will have to try again next Sunday after the tie had to be postponed due to a water-logged pitch. Actonians Ladies are through to the semi-finals of the FAWPL Plate the South East Division One side at home taking on FAWPL Midlands Division One side, Radcliffe Olympic Ladies, both in 4th place in their respective leagues going into the game, a goal from Melissa Jung along with a brace by Carla Williams (pictured) seeing Actonians Ladies win the game 3-0 to make it into the last 4 of the competition. Elsewhere in the FAWPL Plate two sides from the Northern Division make it through to the semi-finals of the competition, Leicester City Women beating Keynsham Town Ladies away from home 3-2 with an extra-time winner to make the semi-finals. A convincing away win for Huddersfield Town Ladies beating lower league Tranmere Rovers Ladies 7-0 away from home to reach the last 4. One match in the FAWPL Southern Division at the weekend with Coventry United Ladies moving back up a place above Cardiff City Ladies into 3rd place with an away win against C&K Basildon Ladies. The sides looked to be heading into the changing rooms at half-time with the score 0-0 until Amber Hughes found the back of the net a minute into stoppage time to see Coventry take the lead. Alison Hall extended Coventry’s lead with 20 minutes left to play before Hughes with her 2nd of the game struck the ball home with 6 minutes left to ensure the 3 points were safe. 3-0 the final score. 4 games in FAWPL South East Division One on Sunday, league leaders, Cambridge United WFC opening up a 4 point gap at the top with an away victory against Ipswich Town Ladies. Nicole Perschky getting the visitors off to a great start putting Cambridge 1-0 up inside the opening 5 minutes. That the score going into the changing rooms at half-time, Danielle Puddefoot striking the post the closest anyone came to a 2nd goal. 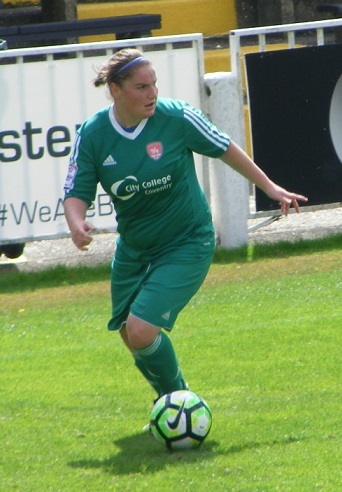 Dawn Mallett (pictured) found the back of the net from a 25 yard free-kick 15 minutes into the 2nd half to make it 2-0 to Cambridge before they ran away with the score in the final 10 minutes, Mallett and Perschky both scoring their 2nd goals of the game on 80 and 83 minutes, Puddefoot scoring with 2 minutes of normal play left to see Cambridge win 5-0. AFC Wimbledon Ladies were on the road again on Sunday for a 2nd successive trip to Norfolk to play Norwich City Ladies the 2nd placed side having knocked Norwich out of the FA Women’s Cup with a 4-1 win. The sides playing out a goalless 1st half at Plantation Park it was Wimbleson who went on to take the lead Rebecca Sargent opening the scoring 10 minutes into the 2nd half. Norwich have plenty of games in hand on everyone else in the league 3rd bottom however it’s the points they need with just 1 win from 5 played to date. Paige Shorten getting the goal inside the last 10 minutes to see them draw the game 1-1 and see the points shared. 3rd placed Milton Keynes Dons Ladies made the long trip up to the Suffolk coast on Sunday to play Lowestoft Town Ladies at Crown Meadow. The sides going in level at 1-1 at half-time, Molly Hall scoring on 35 minutes for Lowestoft. Milton Keynes Dons with a strong 2nd half performance going on to win the game 6-2. A brace each for Leah Cudone and captain Charly Clarke with a gaol each for Charlotte Matthews and Vicky Holland. Captain, Hannah Waters with the 2nd half goal for Lowestoft. A big away win for Gillingham FC Ladies on Sunday in the league against Denham United Ladies to see them move up 2 places into 4th spot in the table, still unbeaten in the league with games in hand on the sides above them. No goalscorers on record yet in a 9-0 victory. One match postponed from last Sunday in the FA Women’s Cup 1st Round Proper with FAWPL Southern Division side, Swindon Town Ladies travelling to the South Coast to play Southern Region Women’s Premier Division leaders Southampton Women FC. The side 2 leagues below Swindon picking up a great result winning the game 2-0 with a goal in each half from Kirsty Bell and Laura Gilbank. Southampton Women FC will now be away to FAWPL South East Division One leaders, Cambridge United WFC in the 2nd Round Proper the tie to be played Sunday 8th January. This entry was posted in FA Women's Cup, fawpl league cup, FAWPL League Plate, FAWPL South East Division One, FAWPL Southern Division, The Round-Up and tagged FA Women's Cup, FAWPL Cup, FAWPL Plate, FAWPL South East Division One, FAWPL Southern Division, The Round-Up on December 13, 2016 by WFEast. The focus in the FAWPL was on the last 16 of both the Cup and Plate competitions with 13 sides from the Southern and South East Division One vying for a spot in the quarter-finals. FAWPL Cup holders Tottenham Hotspur Ladies are through to the quarter-finals maintaining an unbeaten record in all competitions seeing off a potential 2nd half comeback from South East Division One opponents, Gillingham FC Ladies. At home Tottenham were leading 3-0 at half-time Lucia Leon opening the scoring with Maya Vio scoring their 3rd goal an own goal in between. Gillingham pulled it back to 3-1 in the 2nd half Felicity Gibbons scoring on 62 minutes, Amy Taylor scoring to make it 3-2 with just 3 minutes left, a late fightback stiffled out by Tottenham as Wendy Martin scored late in the game to make it 4-2 and see Tottenham continue the defence of the cup. Tottenham beat Cardiff City Ladies in last seasons final and the Welsh side also join them in the quarter finals with a comfortable home win over previously unbeaten Chichester City Ladies from FAWPL South West Division One. On home soil Cardiff got off the the perfect start Kerry Bartlett putting them ahead inside 2 minutes. Chichester responded well getting it back to 1-1 insdie the opening 10 minutes Chloe Dowdell putting the ball into the back of the net. After that Cardiff took a firm grip on the tie Laura Willaims with 2 quick fire goals on 15 and 17 minutes. 10 minutes later Cori Williams made it 4-1 to Cardiff from the penalty spot. Chloe Chivers and Abbie Britton adding their names to the scoresheet to see Cardiff lead 6-1 at half-time. A quieter 2nd half Chivers added another goal to the total striking the ball home from distance to see Cardiff into the quarter-finals with a 7-1 victory. 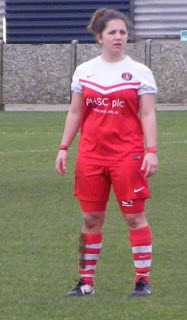 Charlton Athletic Women were at home on Sunday in the 3rd Round of the FAWPL Cup taking on fellow Southern Division side, Portsmouth FC Ladies. It was the visitors who held the advantage at the break with Samantha Quayle giving Portsmouth the lead on the 29th minute. Charlton responded 2nd half Kit Graham scoring just 2 minutes into the restart added her 2nd goal to put Charlton into the lead 5 minutes later. Giorgia Dunne scoring to put the home side 3-1 up 4 minutes later. 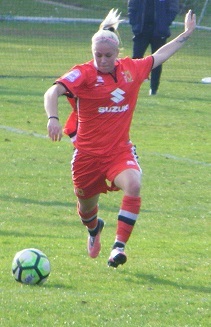 Graham completed her hat-trick on 70 minutes. Gemma Hillier pulled it back to 4-2 for Portsmouth 10 minutes from time as they exited the competition. News from Portsmouth earlier in the day with the announcement manager Craig Taylor who took up the role at the start of the season is stepping down from the role. Jay Sadler taking on the role as caretaker manager. In the final 3rd Round FAWPL Cup tie it was another all Southern Division clash and it was Crystal Palace Ladies who were celebrating reaching the quarter finals of the competition beating Coventry United Ladies at home on Sunday a close game, a single goal winning the match 10 minutes from time, Rochelle Shakes the goalscorer to send Crystal Palace Ladies through. The draw for the FAWPL Cup quarter finals was made on Monday the game scheduled to be played Sunday 11th December. At this rate Lewes Ladies will reach the final of the FAWPL Plate without kicking a ball as for the 2nd time in a row in the competition their opponents pulled out of the scheduled tie late on forfieting the game. Lewes were due to face St Nicolas Ladies from FAWPl South West Division One their opponents unable to field a team. Lewes Ladies awarded the home win to move into the quarter finals. Elsewhere in the 3rd round of the FAWPL Plate fortunes weren’t so good for the remaining Southern Division sides left in the competition. Queens Park Rangers had gotten their 1st win of the season in the previous round of the Plate were drawn away for a local derby against Actinians Ladies from South East Division One who have ejoyed a great start to the season, their good form continuing as captain Sinead Friel and Melissa Jung put them into a 2-0 lead. Sara Ezzahiri pulling a goal back for QPR late into stoppage time not enough as Actonians advance into the quarter finals. West Ham United Ladies exit the FAWPL Plate at the 3rd Round stage too, at home on Sunday playing South West Division One side Keynsham Town Ladies, Whitney Locke had given them a lead to take into the dressing room 2 minutes before the half-time whistle. Geovana Christina dos Santos Alves getting it back to 1-1 for Keynsham early in the 2nd half Stacey Pearson giving the visitors the lead on 62 minutes. Yasmin Pratt scored to make it 3-1 for Keynsham with 10 minutes left on the clock. Shannon Albuery pulling it back to 3-2 with 5 minutes left for West Ham United, wasn’t enough as Keysham held on to win to move into the quarter finals. In the final 3rd Round tie to bring you from the FAWPL Plate it was an all South East Division One clash with Stevenage Ladies at home taking on Luton Town Ladies. Goals from Jess Mckay and Joanne Rutherford seeing the visitors advance to the quarter finals with a 2-0 win. The FAWPL Plate quarter final draw was also made this Monday the ties to be played Sunday 11th December are as follows. There were also three matches scheduled to be played on Sunday in FAWPL South East Division One, heavy rain in Norfolk on the Saturday saw Norwich City Ladies games against AFC Wimbledon Ladies called off. With the 2nd placed side not in action at the weekend that gave an opportunity for league leaders, Cambridge United WFC to extend their lead at the top of the table. The visitors to Mildenhall town FC, Enfield Town Ladies the A10 derby always a close game between the 2 sides. Nicole Perschky opened the scoring giving Cambridge the lead midway through the 2nd half. Donjeta Krasnici getting Enfield back on level terms just before half-time. Substitute, Evie Gallop restored Cambridge’s lead with 20 minutes left to play Rosie Kmita firing home 5 minutes later to make it 3-1. Kally-Ann Jo Westgrath scored for Enfield on the 85th minute, Cambridge held out for the win and the 3 points that take them 5 points clear at the top of the league. Milton Keynes Dons Ladies are up to 3rd in the FAWPL South East Division One table with a big home win at the weekend taking on Denham United Ladies. Goals from Hannah Barrett and Heather McDonnell saw them leading 2-0 at half-time before going on to add 5 more goals in the 2nd half. Charley Clarke making it 3-0 an own goal adding to the score line. Leah Cudone (pictured left) getting in on the goal scoring action with a brace to make it 6-0. McDonnell with her 2nd of the match seeing Milton Keynes Dons Ladies move above Actonians Ladies into 3rd. This entry was posted in fawpl league cup, FAWPL League Plate, FAWPL South East Division One, The Round-Up and tagged FAWPL Cup, FAWPL Plate, FAWPL South East Division One, The Round-Up on November 8, 2016 by WFEast. This weekend in the FAWPL their was just the one league game with the focus on the 2nd Round of the Cup and Plate comprtitions, 9 ties across both featuring sides from the Southern and South East Division One. 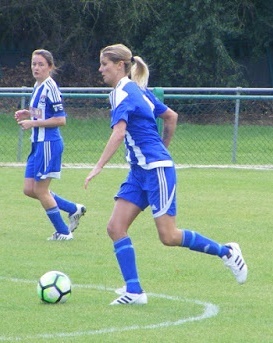 In the FAWPL Southern Division C&K Basildon Ladies were at home hosting Swindon Town Ladies and Canvey Island FC. The visitors coming into the game off the back of a confidence boosting 7-0 win away to Queens Park Rangers Ladies last Sunday. Battled hard 1st half despite C&K Basildon creating plenty of chances the score remained goalless at the break. That changed 4 minutes into the 2nd half C&K Basildon getting the lead a goal from Sara Sinclair. The home side continued to press for a 2nd goal, Swindon resiliant keeping them at bay until deep into injury time, Lily Mellors putting the result beyond doubt in the 93rd minute to see the game won 2-0. Tottenham Hotspur Ladies the FAWPL Cup holders continued their defence of the trophy at home taking on last seasons beaten FAWPL Plate finalists, Enfield Town Ladies. 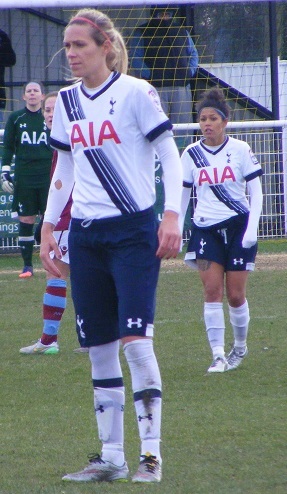 Had the majority of the play in the 1st half, the South East Division One side hard to break down Tottenham got into the lead 6 minutes before half-time Wendy Martin (pictured) with the goal. Martin went on to score 2 goals in 2 minutes 15 minutes into the 2nd half to complete her hat-trick. Lucia Leon adding another goal to make it 4-0 with 15 minutes left. Manager Karen Hills brought Martin off with 5 minutes left replacing her with goalkeeper Toni-Anne Wayne playing outfield up front almost scored straight away. Enfield pulled a goal back late on with two minutes of normal time left, Ellie Taladiana with the goal. Injury time and Wayne is played through in behind the Enfield defence racing into the box puts her shot past the keeper into the back of the net to score! Tottenham winning 5-1 to advance into the last 16. Was an all FAWPL South East Division One clash at Corinthians FC, the new home for Gillingham FC Ladies this season unbeaten in all competitions so far this season were taking on Milton Keynes Dons Ladies. Despite having the majority of the ball 1st half found it hard to break down a well drilled Milton Keynes Dons defence. The visitors creating the best chance young goalkeeper Katie Startup saving well from a powerful header driven in near post the follow up headed onto the crossbar. A change of formation and the introduction of striker Kallie Balfour did the trick 2nd half for Gillingham, Balfour breaking down the left driving the ball in across thre keeper near post. Balfour adding a 2nd her shot from inside the box going through the keeper to make it 2-0 see Gillingham into the last 16 where they will be away to Tottenham Hotspur Ladies. This game was the featured match report on the Supporting Women’s Football Blog and the entire report can be found further down the page or by clicking on the link below. Postponed last weekend after heavy rain on the South coast, FAWPL South East Division One side, Cambridge United WFC in fine form at the start of the season made long trip down to Gosport borough FC to play FAWPL Southern Division side Portsmouth FC Ladies. Cambridge have been building a strong squad to mount a promotion challenge added 2 more signing earlier in the week, Danielle Puddefoot coming in after a prolific season in front of goal for Queens Park Rangers Ladies last season, also joining is Mollie Kmita who joins her sister Rosie in signing for Cambridge. Both Kmita sisters started the match and it was Rosie who gave the visitors an early lead in the match had a few more chances to extend Cambridge’s lead 1st half however Portsmouth kept the scoreline down to a single goal chances up the other end equalised late captain Gemma Hillier making it 1-1 in 1st half injury time. Portmouth went on to take the lead 2nd half Sarah Kempson scoring in 61 minutes. Their lead didn’t last long Cambridgegetting it back to 2-2 within 3 minutes Nicole Perschky on target. Portsmouth were to go on and score again Kempson with her 2nd goal 6 minutes from time enough to see them edge the result 3-2 to advance into the last 16. Another side riding high in FAWPL South East Division One are AFC Wimbledon Ladies, they were at home in the 2nd Round of the FAWPL Cup taking on Southern Division opposition in Crystal Palace Ladies. The sides battled out a goalless 1st half, Crystal Palace took the lead over their lower division opponents 12 minutes into the 2nd half, Gemma Bryan putting them ahead. The lead was doubled in the last 10 minutes, Rochelle Shakes making it 2-0 for Crystal Palace to see them through to the last 16 of the FAWPL Cup. It was also an FAWPL Southern Division side taking on South East Division One opponents in the last game to bring you from the FAWPL Cup 2nd Round with Coventry United Ladies the current FAWPL Plate holders taking on Denham United Ladies. Once again it was goalless at the break their lower league opponents had to break down. The deadlock was broken midway through the 2nd half, Ashleigh Neville getting the goal to give Coventry the lead made sure of the result in the last 10 minutes of the match, Jade Brook and Helen Dermody both netting a goal to see Coventry into the last 16 with a 3-0 win. Cardiff City Ladies or Larkhall Athletic Ladies v Basingstoke Town Ladies or Chichester City Ladies. Queens Park Rangers Ladies were without a single league point this season in the Southern Division as they made the long journey to the Suffolk coast to play South East Division One side Lowestoft Town Ladies in the FAWPL Plate 2nd Round. An good contest 1st half Lowestoft doing well against their higher league opponents conceded late in the 1st half Juliette Denny scoring for Queens Park Rangers in the 4th minute of 1st half injury time to give the Southern Division side a narrow lead going into the dressing room at half-time at Crown Meadow. Queens Park Rangers started the 2nd half strongly, extending their lead on 54 minutes Jessica Treharne with the goal. Looked to be safely through to the last 16 of the Plate competition when Sara Ezzahiri scored to put them 3-0 up with 10 minutes to go. Late drama in the match however Lowestoft winning a penalty 2 with 2 minutes of normal play left, Gemma Moore scoring from the spot. Millie Cursons putting the ball in the back of the net on 90+1 to make it 3-2. Denny having scored in injury time 1st half repeated the feat 2nd half scoring her 2nd in the 93rd minute to see Queens Park Rangers win their 1st game of the season taking them through to the next round. A long journey west for West Ham United Ladies in the FAWPL Plate 2nd Round taking on South West Division One side, Cheltenham Town Ladies. The 1st game of a new era for West Ham United Ladies under new management having been brought under the umbrella of the men’s club were introduced at half-time to the West Ham United fans at the Olympic Stadium on Saturday. On the pitch against Cheltenham got off to a great start Katie Bottom putting them ahead on 15 minutes from the spot after she was brought down in the area. Cheltenham battled hard, putting alot of effort in to keeping the lead down to a single goal at half-time. Started the 2nd half better gaining momentum, Louise Fensome pulling the scores level at 1-1 the game looked to be heading into extra-time, Chloe Burr getting on the ball driving forwards and rifling home a shot in injury time to see West Ham United win 2-1 to progress the last 16. An all South East Division One clash in the 2nd Round of the FAWPL Plate saw Ipswich Town Ladies travel down to play Actonians Ladies. The home side knocking their Suffolk opponents out of the Plate with an emphatic win. Alessandra Barreca scoring a hat-trick for Actonians, with goals too for Emma Mulhern, Carla Williams and Sinthujah Sooriyakumar seeing them advance in the competition with a 6-0 victory. South East Division One side Stevenage Ladies still looking for their 1st league win of the season made the long trip down to the South West to play fellow Division one side Exeter City Ladies. Had won big in the FA Women’s Cup 2 weekends ago giving the squad some confidence. That confidence was extended with another cup win as they returned home with a place in the last 16 of the FAWPL Plate secured following a 4-0 win. The draw for the 3rd Round of the FAWPL Plate was made earlier in the week, ties scheduled to be played Sunday 6th November, selected ties below featuring sides in the Southern and South East Division One. This entry was posted in fawpl league cup, FAWPL League Plate, FAWPL Southern Division, The Round-Up and tagged FAWPL League Cup, FAWPL League Plate, FAWPL Southern Division, The Round-Up on October 25, 2016 by WFEast. Sunday’s match action on the Supporting Women’s Football Blog comes from the 2nd Round of the FAWPL Cup an all South East Division One clash between Gillingham FC Ladies and Milton Keynes Dons Ladies. This Sunday’s match on the Supporting Women’s Football Blog comes from the 2nd Round of the FA Women’s Premier League Cup an all South East Division One clash between Gillingham FC Ladies & Milton Keynes Dons Ladies. Gillingham FC Ladies have a new home this season, Corinthians FC. Just off the A2 through the villages of Bean and Longfield, ignoring the ‘Road Closed’ signs you find it just fine. In the countryside a picturesque setting you come to the Corinthian Sports Club a multi-purpose sports facility with a farmyard beyond, which you’ll end up in if you follow the Sat Nav, however there is a gate which I suspect is unlocked on most match days at that end. A large clubhouse with a bar upstairs refreshments hot and cold available. The ground itself is very nice a small seated stand behind one goal plus a small stand on one side. More seating in front of the building housing the changing rooms in on corner overlooking a large pitch, plenty of width on this on, not the flattest but in great condition nevertheless. A bright sunny day clouds dotted around but a warm afternoon, will enjoy them whilst they last. Gillingham FC Ladies starting XI – Katie Startup, Ellie Manning, Grace Seely, Charlie Thurston, Vicky Ashton-Jones, Rachel Ahern, Jade Keogh (C), Katie Hardaker, April Bowers, Harriett Chapman & Felicity Gibbons. subs – Courtney Shanly, Bethany Nugent & Kallie Balfour. Milton Keynes Don Ladies starting XI – Emma Kirby, Kara Howes, Samantha Gillings, Leanne Doyle, Vicky Holland, Charley Clark (C), Heather McDonnell, Charly Wright, Hannah Barrett, Leah Cudone & Rebecca Vass. subs – Anna Loftus & Louise Naylor. Gillingham FC Ladies were without a few 1st team regulars but do have a large squad of players to draw from and with the games already building up the squad will be needed although absences and injuries see only 3 named on the bench, one of those goalkeeper Courtney Shanly with Katie Startup recently returned from Jordan having represented England Lionesses side in the U17s World Cup starting between the sticks. Milton Keynes Dons Ladies name a strong starting XI but a light on the bench with just the 2 substitutes to call upon. It’s the visitors to kick-off the 1st half, Milton Keynes Dons Ladies kitted out in red shirts and shorts with a black and white band down the sides, along with red socks with a black and white band. Gillingham lined up opposite wearing blue shirts with a vertical white stripe down the right, blues shorts with a white bands around the left leg and white socks with blue at the top. From kick-off, Milton Keynes look to get the ball out to Leah Cudone on the right bringing the ball down looks to knock it past Gillingham’s Ellie Manning, the full back gets a foot in to win the ball, plays it in field into Katie Hardaker through the middle up to Felicity Gibbons leading the line holding the ball up has Harriett Chapman making a run on the left sends the ball out to her, Milton Keynes, Kara Howes running with her to win the ball tackles to put it out for a throw. Gillingham have started the match brightly have the ball inside the Milton Keynes half, Gibbons with the ball at her feet back to goal looks to link up with April Bowers on the right, her cross lifted up towards the penalty spot is headed clear of the area by Milton Keynes centre back Vicky Holland. Picking the ball up from half-way Gillingham captain, Jade Keogh carries it forwards rolls the pass into Bowers moving right, sends it on for Gibbons breaking into the box on the right side right of goal moving into the six yard box, looks to shoot the angle tight doesn’t get a very good connection with the ball runs tamely into the gloves of Milton Keynes goalkeeper, Emma Kirby. Charlie Thurston fouls Vass up near half-way the free-kick awarded another chance for the visitors to bring players forwards, Barrett plays the ball long up towards the D, Wright goes up to head the ball, doesn’t get a good connection, instead it is deflected wide right into the box, Holland gets hold of it plays the ball back in to Wright who wraps her foot over the ball meeting it on the volley her effort sails high over the crossbar. Late into the 1st half Milton Keynes make a change, Barrett can’t continue is replaced by Louise Naylor. Gillingham have been the dominant side in the 1st half having had more of the ball and the attack however haven’t a goal to show for it. Milton Keynes have sat back in defence and wit no room to get in behind have dealt with most things well played up into the box, have struggled to get their strikers into the game defending so deep waiting for Gillingham to make an error then nipping in on the ball sending it forwards, have had the best chance of the half hitting the crossbar. GOAL! Barely 5 minutes into the 2nd half and Balfour’s introduction makes the difference the ball given to her as she moves to the left side turns and heads for goal a powerful run with the ball at her feet entering the box from the left gets the shot away firing the ball across Kirby at the near post and into the back of the net beyond 1-0. Coming forwards from the back Ahern covers alot of grass before delivering a cross into the box from the right on the diagonal in towards Gibbons who jumps for the ball but can’t make contact as the cross flies over her. A sloppy ball at the back by Gillingham allows Wright to steal in take the ball on the left pushes on up the wing, Ashton-Jones gets back on her to tackle put the ball out for a throw. Taken quickly Wright throws it back to Gillings coming up to support the full-back sweeps a cross into the box players running in it’s Ashton-Jones who gets her head to the ball to clear for Gillingham. Gillingham make their 2nd change with Ahern coming off for Bethany Nugent a straight swap at the back. Keogh carrying the ball forwards passes to Balfour moving left in front of her, turning with the ball at her feet drives into the box shooting the ball lacks any pace doesn’t trouble Kirby at her near post the keeper gathering the ball. A good tackle from Ashton-Jones at the back for Gillingham to concede a throw on the left as Loftus goes forwards for Milton Keynes looking to get in behind as Wright sends the ball on up the wing. With Milton Keynes pushing players on late into the game Gillingham aren’t interested in running the ball into the corner counter attack Keogh on the ball moves to within 25 yards of goal fires a low shot into the box is cleared the ball coming back to the Gillingham captain hits a swerving shot back in towards goal, moving across her line Kirby gets hold of the ball. As Milton Keynes blast a long range strike wide of goal up the other ed the referee blows the final whistle and it’s Gillingham who advance to the last 16 of the FAWPL Cup. A good contest, Gillingham eventually coming out on top adjusting things 2nd half after a goalless 1st 45 minutes. Dominated play but couldn’t break down a well drilled Milton Keynes defence sitting deep. The introduction of Balfour 2nd half altering things found space and with it 2 goals. Milton Keynes were 2nd best today despite hitting the crossbar from a set-piece in each half had less of the attack and few chances for their attackers to test the Gillingham goal. This entry was posted in fawpl league cup, Match Reports, SWF Blog and tagged FAWPL League Cup, Gillingham FC Ladies, Match Report, Milton Keynes Dons Ladies on October 24, 2016 by WFEast. Busy start to the week so this weeks, The Round-Up is a little later than normal. Plenty of games to cover from last Sunday, largely featuring County Cup matches, 1st and 2nd Round games and that means clubs might not be in, The Round-Up where you would expect them to. A limited fixture list in the FAWPL Southern and South East Division One, and some of those ending up being postponed meant just the 4 games were played. 2 in the league and 1 tie in each the FAWPL Cup and Plate 2nd Round. Just the one league match took place in the FAWPL Southern Division this Sunday and although it is still very early in the season this was a huge match at the bottom of the table with Queens Park Rangers bottom of the table without a point on the board after 6 matches hosting 2nd bottom Swindon Town Ladies the newly promoted side just 3 points better off with 1 win from their opening 7 games. Swindon Town climb up 2 places to 8th in the table as they double their points tally with a high scoring win. Opening the scoring 16 minutes into the 1st half, Amy Watham putting the visitors in front, the lead was 2-0 a minute later Samantha Hallsworth with the goal. 8 minutes later Watham was on target again to see Swindon Town lead 3-0 at half-time. Hallsworth scored her 2nd goal of the game 10 minutes into the 2nd half. Substitute Sandy Abi-Elias coming on in the 63rd minute netted for Swindon Town on 72 minutes. Into the last 10 minutes Ellie Maynard brought on at the start of the 2nd half made it 6-0, with Watham completing her hat-trick with 3 minutes left on the clock final score 7-0. Were 2 ties in the FAWPL Cup 2nd Round featuring sides in the region scheduled for the weekend, heavy rain overnight on Saturday saw Portsmouth FC Ladies home match against Cambridge United WFC postponed, they will try again this coming Sunday. Charlton Athletic Women were at home in the 2nd Round of the FAWPL Cup taking on fellow South East Division One side C&K Basildon Ladies. Striker Kit Graham (pictured) put Carlton into a 2-0 lead in the 1st half scoring 2 goals in 4 minutes on 19 and 23. C&K Basildon got it back to 2-1 before half-time captain Zoe Rushen with the goal. 2nd half Graham went on to complete her hat-trick scoring 5 minutes into the 2nd period. C&K Basildon battle hard to get back into the tie, Hannah Porter finding the back of the net late into the game, wasn’t to be enough, knocked out as Charlton win 3-2 to advance to the next round. 2 ties were scheduled in the FAWPL Plate 2nd Round too this weekend, featuring sides in the region. Another postponement with Lewes Ladies meant to be hosting Maidenhead United Ladies who were unable to field a team. In the other 2nd Round tie, South East Division One side Luton Town Ladies had a long trip down to the South West to play Plymouth Argyle Ladies. Nicola Henman putting Luton into the lead in the 1st half. Plymouth were reduced to 10 players just before half-time Kayleigh Lane red carded for stamping on an opponent. Luton pushed for more goals against Plymouth’s 10 2nd half but it was the home side who would score, Tori Marks levelling the tie at 1-1 on 62 minutes. Luton picked thing’s up after that, 16 year old Jodie Bellinger having come on in the 1st half due to an injury scoring her 1st goal for the 1st team, went on to score 2 more to make it a hat-trick. Plymouth pulled a goal back late into the game, Kayleigh Brown with the strike, Luton progress to the next round with a 4-2 win. One league game in the FAWPL South East Division One at the weekend, with AFC Wimbledon Ladies travelling to Kent to play Gillingham FC Ladies. The points were shared the sides drawing 1-1 both goals in the 1st half, Emma Keady’s 31st minute goal for AFC Wimbledon cancelling out Jade Keogh’s 17th minute goal for Gillingham who remain unbeaten in mid-table, whilst the point is enough to take AFC Wimbledon back to the top of the table. This entry was posted in fawpl league cup, FAWPL League Plate, FAWPL South East Division One, FAWPL Southern Division, The Round-Up and tagged FAWPL Cup, FAWPL Plate, FAWPL South East Division One, FAWPL Southern Division, The Round-Up on October 19, 2016 by WFEast. Not too many games in the FAWPL this weekend, a couple of league games in both the FAWPL Southern and South East Division One. Attention elsewhere was in the cup competitions the Cup and Plate with the 1st Round ties taking place. Most clubs given a bye to the 2nd Round, just a handful of ties taking place in both. It was a clash of two unbeaten sides in the FAWPL Southern Division on Sunday with 2nd placed Charlton Athletic Women hosting 4th placed Coventry United Ladies. Kit Graham opened the scoring putting Charlton 1-0 up inside 10 minutes. Marie Gauntlett found the back of the net for Coventry 6 minutes later to equalise. On the half hour mark the visitors took the lead, Alison Hall putting the 2-1 in front. 2nd half Coventry went on to dominate the scoreline Gauntlett (pictured below) adding her 2nd goal 3 minutes into the 2nd half going on to score a hat-trick. Hall adding another goal in the last 5 minutes to see Coventry win 5-1 and move above Charlton into 2nd spot in the Southern Division table. Cardiff City Ladies move up to 5th in the FAWPL Southern Division after a 2-1 home win over C&K Basildon Ladies on Sunday. Chloe Chivers scoring the Welsh sides opening goal in the 7th minute. Had a 2-0 lead on the 29th minute, Kerry Bartlett the player on target. C&K Basildon responded captain Zoe Rushen scoring to get it back to 2-1 4 minutes later. 2-1 the half-time score C&K Basildon pressed for an equaliser 2nd half but couldn’t find it the win seeing Cardiff move above them in the table. FAWPL South East Division One side, Denham United Ladies were at home in the 1st Round of the FAWPL Cup taking on South West Division One side, Brislington Ladies. Going into the half-time interval the scores were level at 2-2. Jenny Banfield and Rebecca French scoring Denham United Ladies goals. The tie looked like it was heading into extra-time no more goals coming 2nd half then in the last minute Aimee Durn struck in a shot to win it 3-2 send Denham United Ladies into the 2nd Round where they face a tough away trip to Coventry United Ladies. Two FAWPL South East Division One sides met in the other FAWPL Cup 1st Round tie with Norwich City Ladies making the trip down into Kent to play Gillingham FC Ladies. The home side opening the scoring on 15 minutes, Amy Taylor netting the goal 6 minutes later they raced into a 3-0 lead, Emma Tune and April Bowers scoring. Chelsea Garrett pulled a goal back for Norwich with 3 minutes of the 1st half left however Gillingham went into the dressing room at half-time with a 4-1 advantage Emily Symond with the goal in stoppage time. The second haf was a repeat of the 1st Gillingham winning that 4-1 too, Jade Keogh with a goal on 66 minutes, Felicity Gibbons 3 minutes later then Bethany Nugent scoring as the game moved into the last 10 minutes. Garrett scored her 2nd goal of the game for Norwich then Keogh added her 2nd of the game in the last minute to see Gillingham rack up an 8-2 win to progress to the 2nd Round where they have been drawn at home to Milton Keynes Dons Ladies. Below are some of the selected ties from the FAWPL Cup 2nd Round draw featuring Southern ad South East Division One sides. West Ham United Ladies were drawn at home against fellow FAWPL Southern Division side in the 1st Round of the FAWPL Plate. Held a narrow advantage at half-time, Charlotte Gurr reunited with manager James Marrs after leaving Brighton to join Millwall Lionesses scoring in 1st half injury time. Swindon Town Ladies came back 2nd half getting themselves into a 2-1 lead with 10 minutes left to play, Georgia Walters scoring both of their goals. West Ham United Ladies came back scoring in injury time again, Chloe Burr with the goal to force the tie into extra-time. No more goals came in the extra 30 minutes and the tie headed into a penalty shootout. Indian International goalkeeper, Aditi Chauhan making her 1st appearance for the club this season was the heroine saving 3 penalties to see West Ham United Ladies win the shootout and advance to the 2nd Round where they will face FAWPL South West Division One side Cheltenham Town Ladies away from home. Below is a list of the 2nd Round ties in the FAWPL Plate featuring sides in the Southern and South East Division One. A 2-0 home win over Denham United Ladies on Thursday night had seen AFC Wimbledon Ladies continue their excellent start to the season since promotion to the FAWPL South East Division One. 4 wins from 4 to move above Cambridge United WFC at the top of the table. Were playing again just 3 days later a long road trip up to the Suffolk coast to play Lowestoft Town Ladies who had picked up their 1st 3 points of the season the previous Sunday at home to Enfield Town Ladies winning 3-0. A fantastic start for the visitors, Sami Bock putting them a goal up inside 3 minutes. Lowestoft kept the lead down to a goal were awarded a penalty with 7 minutes of the 1st half left, Gemma Moore putting the ball into the back of the net to make it 1-1 at half-time. 2nd half the home side struck early captain Hannah Waters lobbing the keeper to make it 2-1 on 47 minutes, the lead didn’t last long Rebecca Sargent making it 2-2 on 50 minutes. Scored her 2nd of the match on 68 minutes to make it 3-1, substitute Sian Wylie scoring direct from a corner to make it 4-2. Lowestoft were awarded another penalty, Moore scoring again to pull it back to 4-3, the final score AFC Wimbledon move 3 points clear at the top with 5 wins from 5. Milton Keynes Dons Ladies returned to winning ways at home in the league after suffering 2 defeats in their opening 3 games. Were taking on Actonians Ladies on Sunday at Newport Pagnell FC. Won the game 4-1 to climb up into the top half of the table. Heather McDonnell scoring a brace with a goal a piece for Charly Clarke and Sophie Watson. Katrina Duncan scoring Actonians Ladies goal early in the 2nd half. This entry was posted in fawpl league cup, FAWPL League Plate, FAWPL South East Division One, FAWPL Southern Division, The Round-Up and tagged FAWPL League Cup, FAWPL League Plate, FAWPL South East Division One, FAWPL Southern Division, The Round-Up on September 27, 2016 by WFEast. Welcome to the 3rd edition of The Round-Up focusing on the FAWPL Southern and South East Division One the 2016/17 is into it’s 3rd weekend. A different slant on this edition however as the league takes a break with all of the FAWPL sides contesting the 6 leagues across the country enter the Determining Round of the FAWPL Cup. You know how it works by now into it’s 3rd season this weekend sees the sides drawn together with the winner of each tie going on to contest the FAWPL Cup proper the losing sides going on to fight for the FAWPL Plate. Tragically 18-year-old footballer, Zoe Tynan lost her life earlier in the week an U19 England player she had recently signed for Flyde Ladies. In remembrance a tribute of a minutes applause took place before every FAWPL and FAWSL match this weekend. A north/south split with the draw with the Northern Division drawn with it’s North and Midlands Division One counterparts. On Women’s Football East it’s the FAWPL Southern and South East Division One that’s focused on for the Determining Round sides from the South West Division One join those leagues in the draw, 16 ties to bring you and some varying and interesting results so let’s get cracking. We’ll start with the FAWPL League Cup holders, Tottenham Hotspur Ladies who were to begin the defence of the trophy with a Determining Round tie away to West Ham United Ladies playing at their new home, Thurrock FC’s, Ship Lane. The holders proved to be too much for a young West Ham United side as they stormed into an early lead, Lucia Leon with the opening goal inside 5 minutes, Eartha Pond converted a penalty kick 3 minutes late and Bianca Baptiste was put in on goal to make it 3-0 with 10 minutes gone. Wendy Martin cored from the penalty spot herself in between a brace from Nikita Whinnett that saw the ha-time lead extended to 6-0. New signing Renee Hector headed home to score 7 minutes into the 2nd half then ex-West Ham player Kelley Blanchflower added a brace scoring in the 56th and 71st minute. Captain Jenna Schillaci taking the scoreline into double figures, Tottenham showing they mean to hold on to the FAWPL League Cup with a 10-0 win. Last season’s beaten finalists, Cardiff City Ladies made the long trip to Suffolk on Sunday to play Ipswich Town Ladies in the Determining Round proved to strong an opponent for the side a league below them winning the game 5-0 to advance into the FAWPL League Cup proper, Chloe Chivers scoring 2 goals with Chloe Lloyd, Hope Suominen and Cori Williams scoring a goal a piece. Not quite reaching double figures were Coventry United Ladies, winners of the FAWPL League Plate last season would love to be in the final of the Cup competition this time around and the FAWPL Southern Division side were too much at home for South West Division One side, Maidenhead United Ladies. 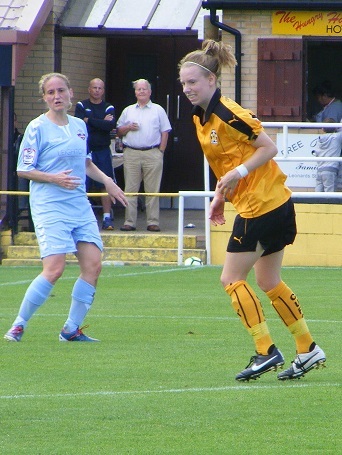 Marie Gauntlett scoring 5 goals in the game after Helen Demody had given Coventry an early lead. Laura Cooper netting in the 1st half. Amber Hughes with a strike early 2nd half plus a goal from Jade Brook saw Coventry United Ladies win convincingly 9-0. The early pace setters in the FAWPL Southern Division welcomed Isle of Wight side Shanklin Ladies to Sporting Club Thamesmead on Sunday. Gemma Shepherd in fine goal scoring form at the beginning of the season plundered 4 more goals against the FAWPL South West Division One side 2 in either half, Kit Graham scored in the 1st half with a goal in each half for new signing Avilla Bergin from Tottenham Hotspur Ladies her 1st goals from her new club, Jenny Newman scoring Charlton’s 8th goal a minute from time. A consolation goal for Shanklin scored by Dani Morris the final score 8-1. Charlton weren’t the only FAWPL Southern Division side to rack up 8 goals in the Determining Round, C&K Basildon Ladies were at home with South West Division One side, St Nicholas Ladies the visitors. Were leading 7-0 at half-time, Sara Sinclair helping herself to 4 goals with captain Zoe Rushn also scoring with a brace from Charlotte Kellet. Karissa Rodney added an 8th goal early 2nd half, St Nicholas managing to stem the goal flow seeing no more goal the final score 8-0. Portsmouth FC Ladies were at home on Sunday in the Determining Round, Lowestoft Town Ladies making the long journey down from the Suffolk coast for the match, plenty of goals in the 1st half, Eilidh Currie giving Portsmouth the lead inside the opening 10 minutes. Sarah Kempson made it 2-0 on 16 minutes. Lowestoft came back getting themselves back on level terms Gemma Moore pulling a goal back 2 minutes later then Broghan Scully making it 2-2 on 23 minutes. Emma Sherwood restored Portsmouth’s lead with half an hour played Kempson with her 2nd goal of the game seeing the home side lead 4-2 at half-time. All Portsmouth 2nd half as they went on to win the game 8-2, Currie and Sherwood going on to score a 2nd goal each Kempson completing her hat-trick in between before substitute, Gemma Hillier scored in the last 10 minutes. Was a long journey west for Crystal Palace Ladies travelling to South West Division One side, Keynsham Town Ladies for the Determining Round. Gemma Bryan (pictured right) giving the Southern Division one a 1st half lead. Keynsham came back 2nd half to level things up from the penalty spot, however Crystal Palace Ladies went on to win the game 2-1, Rochelle Shakes scoring the winner. Suffered an injury blow during the match, striker Nicha Dyatt fracturing her tibia. Women’s Football East wishes her well in her recovery. Some strong performances from FAWPL Southern Division sides there however they didn’t have thing’s there own way in all the Determining Round ties. Lewes Ladies had started their league campaign well and were in confident mood as they travelled up from the South to play Cambridge United WFC, had the FAWPL South East Division One side on the back foot early on Georgia Bridges scoring from a corner kick inside 5 minutes. Were dominant at the start of the match going on to add a 2nd goal on 25 minutes through Rebecca Carter. Cambridge fought their way back into the match slowly creating chances, Lewes Dobear saving brilliantly off Nicole Perschky as she was played in behind for a one on one chance. Perschky got another opportunity to run in behind the Lewes defence before half-time sending the ball past Dolbear to score make it 2-1. 2nd half was a different story Cambridge began to dominate creating chances but finding the Lewes defence a tough nut to crack, time was almost up when the home side won a corner deep into injury time. The ball came smashing off the crossbar as Faith Hewitt struck it from inside the six yard box, Becky Taylor latching onto the rebound took it on before striking home to see Cambridge force the game into extra-time. No more goals in the 1st period of extra-time. Early in the 2nd period Lewes, Rachel Palmer hit a looping ball into the Cambridge area, defender Paige Logie heading the ball into her own net as she tried to clear. That lead was short lived, Perschky given the ball from a superb long pass from Dawn Mallett turning inside stood tall as Dolbear cam to challenge edge of her box, shifting the ball past the grounded keeper Perschky slid the ball into the empty net beyond. After extra-time the sides couldn’t be separated and the tie went to penalties, two saves from Cambridge goalkeeper before Mallett stepped up knowing her side would be through if she scored she did and was promptly buried under her joyous team-mates. This game is the featured match on the Supporting Women’s Football Blog and you can read it by clicking on the link below. Another South East Division One side to win against Southern Division opposition were Denham United Ladies, taking on Swindon Town Ladies at home. Both sides battling their way to a 0-0 draw after 90 minutes the game going into extra-time. Swindon took the lead Chyna Collings getting the goal on 102 minutes. Denham responded Allisa Down scoring to make it 1-1 before Jeta Bytyqi went on to find the winning goal 2-1 the final score. Norwich City Ladies joined Cambridge and Denham in beating higher league opposition in the Determining Round an away trip to play Queens Park Rangers Ladies. Fell behind early on as Jennifer Critchley gave QPR the lead inside 6 minutes. Norwich were back on level terms 8 minutes later, Chelsea Garrett the player on target. Ebony Wiseman put Norwich into the lead scoring with around half an hour played. Liv Thompson got it back to 2-2 for the home side. Into the last 10 minutes of the game Norwich found the winning goal, scored by ex-Nettleham Ladies player, Kyla Love to see Norwich progress into the FAWPL Cup proper. Gillingham FC Ladies travelled down to the South Coast in an all Division One tie playing South West side Southampton Saints. Amy Taylor scoring a hat-trick in the game with Katie Hardaker also getting on the scoresheet in a 4-0 win. Not too far for Milton Keynes Dons Ladies to travel taking on fellow South East Division One side, Luton Town Ladies advance to the FAWPL Cup competition with a 3-1 victory, Hannah Barrett, Anna Loftus and Heather McDonnell with the goals. Last season’s beaten FAWPL League Plate finalists, Enfield Town Ladies welcomed South West Division One side, Exeter City Ladies to the Queen Elizabeth II Stadium a long journey, the 1st half remained goalless. Alena Beganovic got Enfield into the lead early in the 2nd half. They couldn’t hold on Sarah Hill netting for Exeter to make it 1-1 the final score after 90 minutes the tie headed into extra-time. Eliza Diaz got Enfield back into the lead with a minute of the 1st half of extra-time left. The win was sealed in the 2nd period of extra-time, Ellie Taladiana with the goal to see Enfield win 3-1. AFC Wimbledon Ladies also advance into the FAWPL League Cup side newly promoted to South East Division One hosting South West Division One side Plymouth Argyle Ladies. Sian Wylie getting AFC Wimbledon the lead on 25 minutes. Kelly-Jade Whelan making it 2-0 9 minutes later. Plymouth got an immediate response Danielle Salt with the goal the advantage 2-1 to AFC Wimbledon at half-time. Plymouth’s Ezme Wells gets a goal to her name early in the 2nd half to level it all up at 2-2. 20 minutes left on the clock and AFC Wimbledon’s Rebecca Sargent sends the ball over the goal line the winning goal as the home side goes on to win 3-2. Two South East Division One sides will have to settle for a place in the League Plate draw as they lose their Determining Round ties. Newly promoted, Stevenage Ladies were at home on Sunday playing Larkhall Athletic Ladies. Carly Bryant, Kate and Krystle German with the goals in a 3-0 away win for the South West Division side. Actonians Ladies travelled south to play Chichester City Ladies. Despite goals from Chelsea Berlin and Carla Williams, Actonians lost out going down 6-2. Chichester City with 5 different goal scorers a brace for Shannon Albuery, plus a goal each for Emma Alexandre, Rebecca Barron, Luci Challen and Cherelle Khassal. That wraps up this edition of The Round-Up the Determining Round ties settled, 35 sides now go on to contest each competition the Cup and Plate the draws for which will b coming up shortly a preliminary round to whittle each field down to 32 before the 1st Round proper, will update the draws as soon as they’re in. This entry was posted in fawpl league cup, FAWPL South East Division One, FAWPL Southern Division, The Round-Up and tagged FAWPL Cup, FAWPL South East Division One, FAWPL Southern Division, The Round-Up on September 6, 2016 by WFEast. Action from the Determining Round of the FAWPL Cup this Sunday upon the Supporting Women’s Football Blog a trip to Mildenhall Town FC to watch Cambridge United WFC take on higher league opponents, Lewes Ladies from the FAWPL Southern Division the visitors. This Sunday sees the focus in the FAWPL switches from the league to the Cup with all of the 70 sides contesting the 6 Division’s drawn against each other in a Determining Round to decide which competition they will go on to the winners entering the FAWPL Cup competition which was won Tottenham Hotspur Ladies last season the losing sides going on to contest the FAWPL League Plate won by Coventry United Ladies. Today’s match in the Determining Round sees me travel the short distance to Mildenhall Town FC to watch South East Division One side, Cambridge United WFC as they take on Southern Division side, Lewes Ladies. Has been a fair amount of player movement at Cambridge United WFC over the close season as the club looks to build on last seasons record points haul in the FAWPL South East Division One and achieve their aim of promotion to the FAWPL Southern Division. Dawn Mallett has joined the club having had a brief spell on loan last season, has plenty of WSL 2 experience and will provide added steel to the midfield a useful player with a dead ball too. Nicole Perschky and Hollie Jardine both join the club from Stevenage Ladies. Evie Gallop comes to the club from the Essex Centre of Excellence. 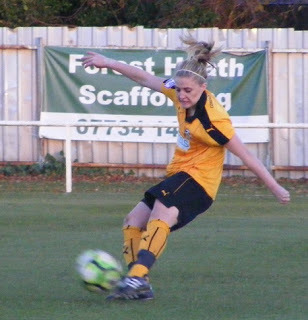 Ashleigh Deacon joins from Watford Ladies and just this week the club announced the arrival of Rosie Kmita having left Tottenham Hotspur Ladies a coup for the club, however she was unavailable to play in today’s cup tie. A good test for Cambridge today in the Determining Round of the FAWPL Cup taking on a side from the league above. Lewes Ladies have in recent seasons established themselves in the FAWPL Southern Division and this season have gotten their season off to a fantastic start winning their opening fixture 7-2 at home to West Ham United Ladies and holding one of the title favourites Cardiff City Ladies to a 1-1 to lay 2nd in the fledgling table. A good start one to build on as their attention switches to the Cup, a long journey up from the South for today’s Determining Round tie. Have a few new signings in their squad too, Rebecca Carter comes to Lewes from Crawley Wasps Ladies. Kim Stenning has playing experience with both Brighton & Hove Albion WFC and Millwall Lionesses prior to joining Lewes Ladies whilst Fliss Love has signed on having been with Brighton’s Centre of Excellence. Have defender Rebecca Thompson back fit to after being out with a long term achilles injury. Mildenhall Town FC is the venue for today’s match, Cambridge United WFC’s new home ground for the 2016/17 season. Easy to find close to the town centre, a fantastic playing surface sloping from one end to the other. Nice clubhouse and refreshments are available hot and cold. A fantastic playing surface the grass lush and green a slope on the pitch from one goal mouth to the other, a good size too. Several dark clouds around, threatening a shower or two, the sun eventually breaking through before kick-off. All clubs across the FAWPL holding a minutes applause before their matches in remembrance of 18-year-old Zoe Tynan who tragically passed away on Tuesday. A young talent gone too soon an U19 England International had recently joined Fylde Ladies. Thoughts are with her family and friends. Cambridge United WFC starting XI – Verity Crook, Emma Jenkins, Hollie Jardine, Kayleigh-Anne Burt (C), Paige Logie, Tahnee Perfect, Evie Gallop, Laura Mills, Ashleigh Deacon, Becky Taylor & Nicole Perschky. subs – Carrie Bennett, Dawn Mallett & Faith Hewitt. Lewes Ladies starting XI – Lauren Dolbear, Hayley West, Charlie Carter, Rebecca Thompson, Kelly Newton (C), Georgia Bridges, Katie McIntyre, Kellie Larkin, Rachel Palmer, Rebecca Carter & Gabby Baldock. subs – Kim Stenning, Danielle Lane & Fliss Love. A slight knock for Cambridge’s captain, Laura Bright saw her sit out the match with vice-captain, Kayleigh-Anne Burt wearing the arm band, Paige Logie joining her at centre back for today’s match. A switch of ends at the coin toss sees Lewes take advantage of the slope 1st half with Cambridge kicking off the game wearing the new Cambridge United strip amber shirts with black vertical lines, black shorts and amber socks. Lewes are in their away colours, an all sky blue kit. Referee David Sorensen has a flat whistle as he blows to start the game a vigorous shake later and it’s back in business. A free kick straight away in the middle for Cambridge as Tahnee Perfect is bundled over a chance to pile players forwards up to the edge of the Lewes penalty box, Kayleigh-Anne Burt over the set-piece flighted up to the top of the area it’s Lewes Charlie Carter who heads the ball clear. Lewes break down the left with Gabby Baldock on the ball taking it into the Cambridge half turns in field, is tackled by Cambridge’s Evie Gallop the ball going out for a throw in. Lewes make headway down the left before the attempted cross goes out of play for a goal kick. GOAL! Less than 5 minutes on the clock and a chance for Lewes who have some tall players in their ranks to bring them forwards to attack the corner kick Kate McIntyre takes the corner is a fantastic delivery whipped into the box with pace, finds Georgia Bridges unmarked facing the near post gets her head over the ball knocking it in past goalkeeper Verity Crook and over the player at the post before she can react. 0-1. A good start from the visitors are causing Cambridge a few problems, Larkins with support from captain Kelly Newton in midfield in particular with Carter up front moving across the pitch to find pockets of space to receive the ball. It’s Carter in possession around the top right corner of the Cambridge box receiving from a throw-in good footwork as she tries to wriggle her way into the area, Burt comes across to make the tackle the ball isn’t cleared far comes back in Cambridge concede the corner. From the right goes long, however the referee spots a push on Crook the free-kick is awarded to Cambridge. More forceful running from Rebecca Carter down the right wing, drives on before squaring the ball into the Cambridge area, players from both sides have been drawn across the pitch, West has gotten forwards is looking to gt on the end of the cross hit a shot goalwards a yard inside the area, Cambridge’s Emma Jenkins closes her down the opportunity is gone. Cambridge aren’t getting much success up front in the opening 15 minutes Laura Mills right and Deacon left trying to make themselves available aren’t getting much change out of Thompson and West in the full-back positions. Counter attack for Lewes, Baldock sending Rebecca Carter away down the left flank, races after the ball, wants to travel inside towards goal, Burt getting back on her forces her wide gets into the box the angle is against Carter nevertheless the gets a shot away with the outside of her boot, Crook has gotten across to cover her near post the shot lacking the power to beat her. Cambridge having been on the back foot are starting to get some joy on the flanks play drawn inside Jenkins is able to run onto the ball in space on the right side her cross into the box is over Nicole Perschky, is cleared by the defender behind for a throw in the right, put back into the Lewes area West clears out to the middle, Mills latches onto it from 25 yards plus out sends the ball arrowing back in towards goal skims the top of the crossbar as it goes out for a goal-kick. A fantastic save from Lewes goalkeeper Lauren Dolbear to keep the 1 nil advantage in tack. Lewes are on the attack the ball is won back as Paige Logie tackles Carter at the back sends the ball long over the top clearing the Lewes defence caught static for a moment not Perschky however as she breaks clear getting her foot on the ball a one on one situation with the keeper developing, carrying the ball inside looks to shoot from outside the box curl the shot around the keeper with her left foot, Dolbear flings herself to her right getting a good glove on the ball turning it wide for the corner kick. Lewes defend the corner at the near post.the ball landing straight at the feet of Becky Taylor 25 yards out left of the box hits the shot back in sending the ball wide across the goal face. This is a busy game alot happening both sides enjoying the pitch the ball travelling well upon it. Baldock has possession wide left for Lewes picks out a great pass to find Larkin central going forwards looks the lift the ball into the area with Bridges trying to steal in behind the Cambridge defence, the lob almost comes off, Logie just stretches her neck muscles to turn the ball away. GOAL! Just as Cambridge look like they might find a way to level things up, Lewes get down the other end and double their advantage getting the ball down the left deep into the Cambridge half win a throw the ball is played into Larkin inside the box her shot is blocked the deflection sends the ball across the six yard box with Rebecca Carter well placed to hit the ball towards goal and score 0-2. Half an hour played and their has been little respite from both sides. Larkin pushes on with the ball taking it to the right as she travels deep into the Cambridge half has Rebecca Carter with her charging on down the wing, has kept Jardine busy on that side the Cambridge left back stops the cross putting the ball out for a corner. Carter breaks from the middle of the area towards the near post to receive the corner lifts her boot connecting with the ball places it wide. Cambridge break the ball fizzed into Perschky back to goal inside the Lewes half, sends the ball out to the right with Mills racing into space getting it onto her feet hits the cross early along the face of the box with players from both sides racing up the pitch, it’s Taylor 20 yards out who latches onto the ball hitting it on the volley, plenty of power in the little chance to control it blasts the effort wide. GOAL! Into the last 5 minutes of an action packed 1st half, Cambridge regain possession of the ball at the back as Lewes attack, launch a rapid counter move as Taylor brings the ball on picking out Perschky with a brilliant pass the striker turns and sprints towards the Lewes area her run identical to her earlier move only this time travelling into a central position reverses the shot playing it back across the diving Dolbear to her left and scores 1-2. A busy 1st half full of entertainment, Lewes getting off to a fantastic start taking an early lead and dominating for a spell took Cambridge a little while to get into the game and just when they did they fell 2 nil down. Kept going and pulled a goal back late in the half to keep this Determining Round of the FAWPL Cup very much alive. Lewes get the 2nd half underway, any chance of rain has gone the sun bathing down now. A double change for the visitors at the start Baldock and Bridges are off with Kim Stenning and Fliss Love coming on. Haven’t even picked up my notepad and Lewes have the ball in the back of the net, Carter free on the right whips a cross into the box, Newton I think is the player who bundles it home, however it doesn’t stand as the linesman’s flag is raised. Deacon fouls Love wide on the right, McIntyre takes the free-kick playing the ball up the line for West to go after plays an early ball across the top of the box looking for Stenning, instead it’s Logie that gets to it first to head clear. Cambridge bring the ball over the half-way line the pass is to Perschky wide left 25 yards out plays the ball crossfield into Perfect who helps it on to Mills, has Jenkins go beyond her on the overlap plays her puts the ball into the box with Perfect trying to get in there, Charlie Carter charges down the ball and it’s cleared. Cambridge are giving a few free-kicks away, gives the chance for McIntyre to play the ball up into the area, is on the ball wide right is virtually a corner kick, is swept into the area at a good height, Taylor back defending for Cambridge heads clear. Love on the ball on the right switches play well putting the ball inside to Larkin who in turn helps it further on for Palmer who strikes from outside the box, slices the ball away from goal. A change for Cambridge as the game approaches the 60 minute mark with Dawn Mallett returning from an injury lay-off coming on to replace Perfect. Cambridge are getting much more possession of the ball 2nd half attacking down the slope, Perschky with the crossfield ball left to right for Mills rolls it back into the middle for Mallett, returns the pass Mills down the wing plays the ball into the box, Charlie Carter near post heads the ball away. Cambridge make a 2nd change Gallop coming off for Faith Hewitt. Cambridge win a free-kick wide right inside the Lewes half Mallett to put the ball in is cleared from the top of the area by Lewes, Jenkins picks it up for Cambridge on the right sends it back in Thompson heads it out this time the counter is on Love travelling with the ball looks to play it on for Carter, the offside flag stops her in her tracks. Cambridge are applying much of the pressure 2nd half however Lewes are defending well, deep not allowing any way in behind. Jardine able to get forwards a little more 2nd half sends a long ball up into the area, looking for Perschky, West does well against her heads it back out of the area is gathered by Mallett 35 yards out sends the shot back in held by Dolbear. Cambridge continue to pressurise Perschky gathering the ball on the run taking it into the area from the left hits it towards goal is straight at Dolbear. For a moment there everyone in the crowd thinks Cambridge have been awarded a penalty, as Taylor dribbling the ball towards the Lewes area is fouled by Charlie Carter it’s just outside however inside the D right side. Mallett on the free-kick hit’s it hard and low, the Lewes wall does its job blocking the shot and getting out to clear. Love is energetic finding space with some lively footwork to get clear of her markers for Lewes pushing inside from the right has Newton making a forwards run for her to get into the Cambridge box, Burt stretching just manages to get to it 1st. With 10 minutes of normal time left Lewes make their final change bring on Danielle Lane for Larkin. The visitors have a corner on the right the delivery into Rebecca Carter a good header from 10 yards out angling for the top corner, Crook shifting to her left jumps and plants her gloves firmly around the ball.Final change for Cambridge a straight swap at left back with Carrie Bennett coming on for Jardine 7 minutes left still 2-1 to Lewes. but both sides are tiring. Perschky has been a threat all game for Cambridge manages to get past Charlie Carter at the back for once, Love tracking back lunges in to win the ball put it out for a throw. Left side the ball is played into Mallett central a great turn gives her a half yard of space 25 yards out to shout puts the ball straight into Dolbear’s midriff. Closing in on the 90 minute mark Cambridge push on the game is stretched, Stenning gets onto the end of a Palmer cross in from the left, looping up Crook holds onto the ball. At the other end Taylor is sent clear through the middle it’s a case of can she be closed down before she gets the ball away into the D, treads on the ball the chance is gone. Into injury time 5 minutes to be added Lewes attack the ball from Lane into Stenning on to Rebecca Carter right she crosses the ball in, Burt gets enough on the ball her deflection taking all the power off the ball runs safely through to Crook. GOAL! A late, late corner for Cambridge players are sent forwards as Mills sends a fantastic ball into the six yard box is headed out of the area by Lewes Cambridge getting hold of it on the left the ball lifted back in is knocked on Hewitt volleys the ball goalwards it rattle the crossbar drops back down into the area Taylor is sharp nipping in to take it then sends the shot into the back of the net to cue wild celebrations as Cambridge make it 2-2. That’s virtually it time for Lewes to get the ball up the other end but not enough time to retake the lead the game ends with the scores level at 2-2 and the game will see another 30 minutes of added time played. Cambridge were the stronger side 2nd half pushing forwards creating chance finding hard to break down a resolute Lewes defence time was running out scoring with their last attack in added time. All substitutes played by both sides which side would find the energy for another goal in extra-time. Cambridge to kick off the 1st 15 minute period of extra-time attacking back up the slope. Have an early chance as the ball is played out to the right Love onto Carter her cross in towards the near post is met by Stenning sends the ball high over the bar. Hewitt for Cambridge launches a shot goalwards from 30 yards out is off target. Cambridge get the ball in from the right win a corner kick Taylor comes towards the ball inside the box drills a head down towards goal is blocked the deflection taking it behind for another corner. Charlie Carter goes into the book as she brings down Hewitt in the centre circle the Cambridge attack almost away after she wins a 50/50 challenge. Mallett plays the ball into the box West and Hewitt go up for it the ball is knocked down across goal Mills meets it on the volley drives over the crossbar. Mallett is fouled in a similar position to the earlier free-kick a little higher up the pitch Players go up into the box, Lewes’ Dolbear claims it they launch a counter attack the ball swept out to Rebecca Carter on the right over half way has support inside from McIntyre plays the ball inside takes on the strike from distance, gets plenty of pace on the ball, Crook leaps across to cover the top corner on her left the shot is just wide. GOAL! There is a goal right at the start of the 2nd period of extra-time the Lewes are on the attack the ball played into McIntyre in the centre brings it on into the Cambridge half passes out to Palmer free on the left, hits the cross early on the diagonal looping the ball up with Stenning going far post. it’s an own goal as Logie attempting to get her head on the ball can only turn it past the stranded Crook and into the back of the net. 2-3. 12 minutes left to play can Lewes hold on to take the victory. Cambridge come forwards down the right Jenkins plays a long ball up towards the top corner of the area Dolbear coming for the ball claims well with Taylor breathing down her neck. Neither side settling for the looming penalty shootout Lewes attack Love with the ball up into Stenning right side into the box her shot straight into Crook across to cover her near post. The ball is soon up the other end the pass long into the box looking for Perschky, Thompson gets back on her to win the ball. Pushing forwards little time left Deacon is played in by Perschky down the left Taylor makes a run through the middle into the box left goes to put the ball across the six yard for Mills, Palmer tracking back defends getting there 1st the ball is cleared but only as far as Mallett who strikes from distance the shot wide. Full-time extra-time and the game will go to penalties. Cambridge to get the penalty shootout underway the players opting to walk down the slope and take the penalties that end. Taylor up 1st for the home side hits the ball hard to the Dolbear’s right she guesses right but her dive is in vain 1-0. Stenning is up 1st to take the penalty for Lewes keeps it low and accurate into the bottom corner to Crook’s left 1-1. 2nd penalty taker for Cambridge is Perschky, hits a high penalty into the back of the net evading Dolbear who again guesses the right way 2-1. Palmer takes Lewes’ 2nd penalty a good penalty kept down to the keepers left 2-2. Lane to take Lewes 3rd penalty, goes to place the ball low into the bottom corner, Crook guesses right throwing herself to her right gets her gloves on the ball to push it away, save the score remains 3-2. Cambridge’s 4th penalty taker is Jenkins goes to put the ball down the middle, Dolbear makes a comfortable save stays 3-2. Charlie Carter up next for Lewes again looks to hit the ball low to the keepers right, Crook throws herself at it and saves another still 3-2. One penalty of the regular 5 left for Cambridge score it and they win the Cup tie. It’s Mallett to take hits the ball low and accurate into the bottom left corner to win it for Cambridge 4-2. That’s it Cambridge win the penalty shootout 4-2 to end a cracking game of football the players race into the area in celebration piling on top of Mallett. It’s a tough way to end a match but has to be settled one way. So Cambridge advance to the League Cup proper whilst Lewes will contest the League Plate not too many sides will fancy drawing them. 35 sides contesting each competition a preliminary round will take place to bring it down to 32 for the 1st round proper. A great advert for women’s football the game ebbed and flowed, drama Cambridge coming back from 2-0 to score an equaliser deep in injury time to force extra-time, both sides going on to score in extra-time then the drama of penalties. I’m exhausted writing this match report so can only imagine how the players feel. My thanks to Lewes Ladies, Jane Roberts for her help with the team details today. Best of luck to both sides for their respective cup competitions. This entry was posted in fawpl league cup, FAWPL South East Division One, FAWPL Southern Division, Match Reports, SWF Blog and tagged Cambridge United WFC, FAWPL League Cup, FAWPL South East Division One, FAWPL Southern Division, Lewes Ladies, Match Report on September 5, 2016 by WFEast. The latest report on on my Supporting Women’s Football Blog features a tie from this Sunday’s Determining Round of the #FAWPL Cup. A trip down to Cheshunt FC the new home of Tottenham Hotspur Ladies as they took on visitors Lewes Ladies, a team I have been keen to see play for some time to as the name of the round suggests determine whether the victor would be entering the FAWPL Cup proper or going into the pot to contest the FAWPL Plate instead. Click on the link below to read the match report. This entry was posted in fawpl league cup, Match Reports on August 31, 2015 by WFEast. This entry was posted in fawpl league cup on August 29, 2014 by WFEast.